Mom & Tots on Mondays and Fridays at Fly High Trampoline Park! 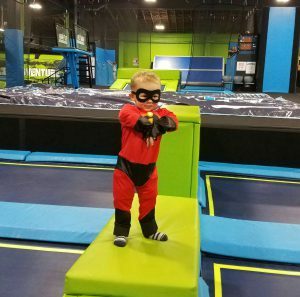 Every Monday and Friday morning from 10 AM – 2 PM pm is Mom & Tot time at Fly High Trampoline Park in Ogden. Parents can jump for only $8 per hour. 3-5 yr olds can also jump for only $8 per hour. 2 and under are free with a paying adult. Don’t forget your jump socks! With Mom & Tot pricing, your little ones can enjoy all our fun features with kiddos their own size and age. 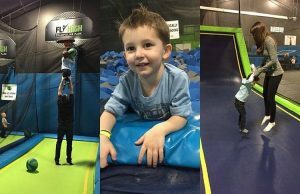 Plan your next play group at Fly High Trampoline Park in Ogden! Don’t feel like jumping? Sit back and enjoy watching your little ones while surfing the internet on our free wifi, watch some TV, get a snack from our snack bar including Zeppe’s Italian Custard. Simply come in and mention this deal!